You might have guessed, based on my choice of yarns for Rogue, that I am a bit of a yarn snob. And you would be right. I’m not snobbish about price–I have found a number of perfectly good yarns that retail for dirt cheap–nor am I snobbish about fiber type–although I’ve inherited some of my mother’s disdain for acrylic, there are a number of acrylic yarns I am perfectly happy to knit with, if the project requires acrylic. Mostly, I’m just a stickler about quality. I have bought yarn from a big box craft store exactly twice, and both times I wound up regretting it. I would have been better off taking the $5-10 and spending it on a hundred yards of good quality yarn from a real yarn shop, than spending it on a thousand yards of yarn horror. The first time I bought Lion Brand Homespun in an iridescent purply colorway. I had planned on making a scarf for a friend from it. It knit up quickly, but that’s about all the good I can say about it. First problem: the ball band was glued to the skein. 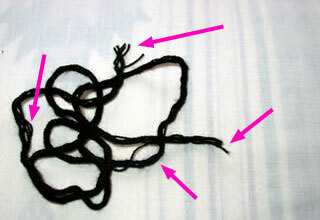 Second problem: the yarn is terrible. It is a plasticky, staticky mess that frays immediately when cut. The fringe on the scarf wound up looking not so much like fringe, but a long purple beard. I could not in good conscience give this scarf to my friend, even de-fringed. I wound up making her a scarf and hat set out of some ZarOne by Filatura di Crosa instead (see picture below). The Homespun? I hated it so much that I took the one remaining skein back to Big Box Craft Store and got my $2 back. The second time I bought Lion Brand Microspun, having been lured by its bright-colored softness. I intended to make gift bags out of it. The name “Microspun” is utterly misleading, given that it starts unspinning itself the second it gets pulled out of the skein. It’s as if the four plies had a massive falling out in the skein, and now they can’t get away from each other fast enough. The yarn doesn’t even make good scrap yarn, given that its fraying tendencies can’t withstand repeated re-threading through even the most giant of tapestry needles. This is what Microspun looks like after you’ve worked with it a bit. Witness all the places where the yarn is literally falling apart. The yarn does not want to hold together at all, splitting on your needles, and then shredding and fraying like mad (this seems to be a consistent “feature” of the Lion Brand yarns I’ve tried) at the slightest provocation. On top of everything, it wears poorly and attracts dust like nothing else. The last thing I attempted to make out of Microspun before relegating it to the wish-it-were-as-good-as-scrap heap was a cell phone cozy. After about a week of use, the thing had snagged in a bunch of places and looked incredibly beat up and dusty. Now if you’ll excuse me, I’m going to go soothe my nerves with some nice Cascade 220 Superwash, which I have abused horribly in the course of making this bag and yet it still looks like yarn. CogKnition posted this on March 26th, 2006 @ 6:46pm in Yarn | Permalink to "Macro Hate for Microspun"
If it attracks dust so well – Make some dusting rags with it! 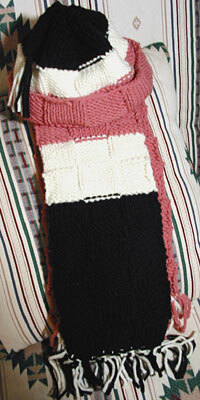 It’s so funny that you say that because that’s exactly what I meant to do–make a Neopolitan ice cream scarf! I wound up going with black because I couldn’t find a yarn line that had pink, white, and brown in shades I liked. Actually my very very first reaction to it was that it looked like those Brach’s Neapolitan coconut candies I’d always get in my candy stash at easter. So I guess you did a pretty good job if that’s what you were going for *G*. That was a lot of yarn angst there. What a waste of perfectly good money and time. Microspun is pretty bad stuff and splitty. I hate the stuff and am still looking for a non wool, non acrylic yarn for socks for someone. Homespun has it’s uses but they are few. I suspect an afghan might be the one, and I’ve seen a nice looking shawl made out of it. Ah ha ha…I think every knitter has had that experience (of crappy craft store yarn). I also only buy the nice stuff now, in the long run it is a much better buy! That microspun looks like crap, though I agree in the skein it looks nice. LOL! That sounds much like the same conclusions I’ve come to about both of those yarns! I tried making an octopus toy out of Homespun, and frogged it and started over no less than three times before finally giving up and taking it back. I totally agree about the plastic feeling and how it frays right away….and the Microspun? Don’t even et me started!!! I used it to make blanket stitch n a fleece blanket for my daughter, and it was such a nightmare! I finished it, but will never use that yarn again for anything!!! Wow! I’m so glad I read this. My elderly father wants a cardigan, and I thought this would be good because it’s so soft – I am definitely not using Microspun now.